This Contribute post was provided by Jolene de Verges, Director, Hamon Arts Library, and Cindy Boeke, Digital Collections Developer, Central University Library, Southern Methodist University. Dallas, Texas, ca. 1902-1919, stereograph from the George W. Cook Dallas/Texas Image Collection held by the DeGolyer Library. SMU’s Central University Library received a $25,000 TexTreasures grant, sponsored by the Texas State Library and Archives Commission and the Institute of Museum and Library Services, to digitize portions of the collection. Southern Methodist University (SMU) is a 100-year old private university located in Dallas, Texas, with a strong foundation in the humanities and sciences and undergraduate, graduate, and professional degree programs throughout seven schools. To make its extensive special collections available online, the Central University Library manages the Norwick Center for Digital Services (nCDS), a full-service digitization and metadata services operation. Collections are presented through the CUL Digital Collections website. Anyone can use these primary resources for research and pedagogy. Already, some 50,000 image, text, and audio/video files are online that include strong concentrations in railroads, Texas history and art, Mexico, the U.S. West, the U.S. Civil War, SMU history, African American films, and more. A new digital production librarian joins the staff of the Norwick Center this month. A separate digital project is underway at Bridwell Library that has made more than 4,000 image, text, and audio/video files available, with ten new collections in progress. Bridwell Library Digital Collections include rare books, manuscripts, broadsides, prints, and archival letters, documents, and photographs representing the institution’s major collecting areas: archives, bibles, church history, theology, popular religion, devotional literature, European printing before 1501, Reformation and Counter-Reformation, and Wesleyana and Methodistica. The Norwick Center has available the following tools in its digitization center: small and large format scanners, specialized book and map scanners, a high-resolution digital camera and digital photography studio, and equipment to capture and digitize audio, video, and 16 mm film. Norwick adheres to high standards of digitization, metadata creation, and digital collections management through documented best practices, workflows, and procedures. The guidelines for digitization are outlined in SMU Central University Libraries Digitization Guidelines and Procedures. Metadata cataloging and file-naming guidelines are described in the SMU CONTENTdm Guide: Framework for Building a Collection. nCDS serves as a teaching lab with a longstanding MLS practicum that provides students with hands-on experience and training in digital collections development. Work during the practicum is focused on digitization, metadata creation, digital collections software training, and outreach. Since fall 2009, nCDS has hosted 28 MLS practicum students and library school graduates, many of whom use their newfound skills in a wide range of jobs throughout the library profession. In fall 2013, nCDS began hosting a Digital Humanities Practicum, which allows SMU graduate students to learn about the growing use of technology and software tools for teaching, research, and scholarship in the humanities. Staff at nCDS teach the students digitization, metadata creation, and digital collection development using CUL Digital Collections. Feedback on the practicum has been overwhelmingly positive. 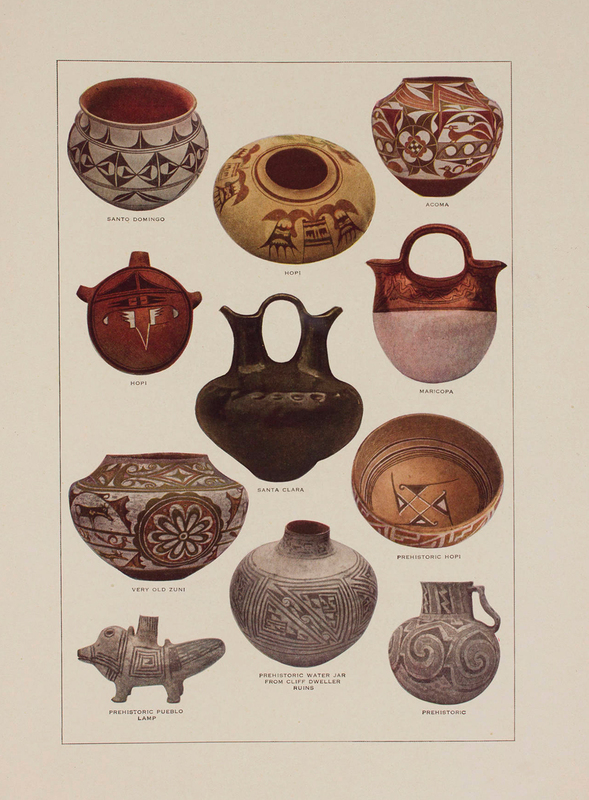 Never Were Two Pieces of Indian Pottery Exactly Alike, [page 53 of American Indians: First Families of the Southwest, 1920]. The metadata for this book was annotated by Carrie Johnston, SMU English Ph.D., 2013, as part of the Fred Harvey Co. Materials from the DeGolyer Library Digital Humanities project. The SMU graduate students often add historical context to their digital humanities projects. In 2013, for example, Carrie Johnston, then an English Ph.D. candidate, created the Fred Harvey Co. Materials from the DeGolyer Library, which brought to light new information on the development of tourism in the U.S. Southwest. Carrie’s project not only attracted interest from unexpected venues, it also led to a transformative change in her career path. In 2015 she accepted a two-year Postdoctoral Fellowship in Digital Scholarship at Bucknell University, a position made available through the Council on Library and Information Resources and partially funded by the Mellon Foundation. The SMU Digital Repository is a growing collection of the university’s scholarly output. Started in 2012 on the Digital Commons platform, the repository added the SMU Law Review in January 2015. Working papers from SMU’s Cox School of Business and student projects from the campus Engaged Learning program are especially popular communities. More law journals are anticipated in the future, as well as a pilot project for depositing ETDs. The SMU Digital Repository is a partnership between the Central University Libraries, the Office of Research and Graduate Studies, and the Office of Information Technology. Staffing and coordination of policies are managed by a digital repository manager, assisted by an Advisory Group and a Digital Repository Committee. SMU is taking a systematic approach, working with individual faculty and reaching out to departments to encourage submissions. The areas of policy, outreach, and distribution of managerial tasks and roles are evolving. 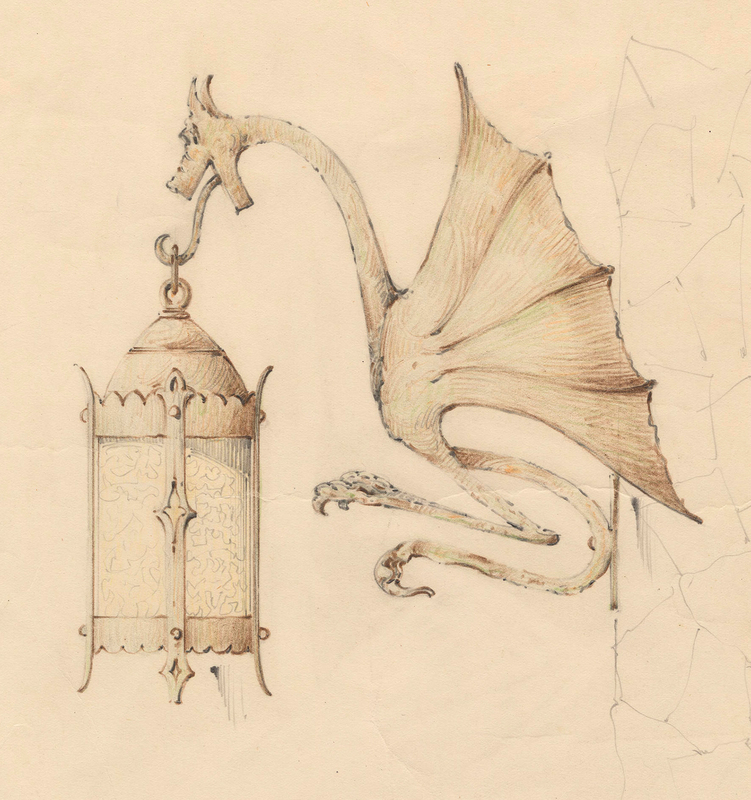 [Lantern Wall Sconce with Dragon Design], 1934, shop drawing from the Potter Art Iron Studios Collection held by the Bywaters Special Collections, a unit of the Hamon Arts Library. The Hamon has nine digital collections, as well as a program for digital media management in partnership with SMU’s Meadows School of the Arts. Hamon Arts Library is devoted to the visual, performing, and communication arts, serving the Meadows School of the Arts at SMU. In 2014, in response to the increasing emphasis on digital audio and video in the creative disciplines of Meadows—concert recordings, dance, theater, and opera productions, student and faculty work in film and video—a staff position was retooled to focus on the growing output of born-digital assets. The digital media librarian works collaboratively with the divisions in the Meadows School and with digital collection colleagues in CUL to manage unique digital assets throughout their lifecycle, especially regarding their submission and dissemination. When fully operational, this service will archive the highest quality media available and apply life-cycle preservation standards to the metadata and file formats. A University Data Center recently opened on campus and a Digital Asset Management System was implemented to address the storage, metadata, and dissemination of digital assets. Expertise in these areas is evolving rapidly among the CUL staff.